New conceptual button design which helps a user to operate the menu easily. 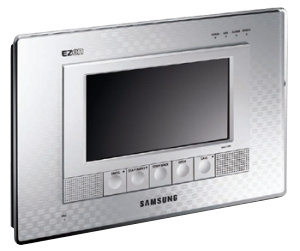 -The main feature of the Samsung Wall Pad (SHT-7171) is a new conceptual button design which helps a user to operate the menu easily. -The LCD screen size is 17.7 cm (7-inch). The Wall Pad (SHT-7171) has an Open Door function, Call the Elevator and Security (intruder, gas leakage, etc.) functions. 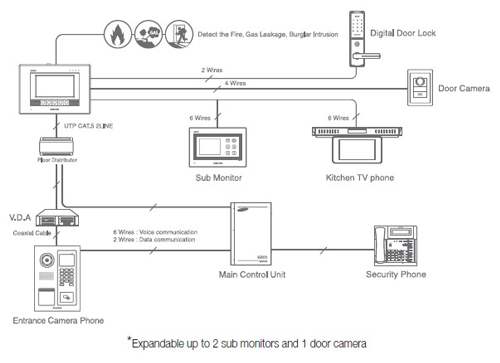 It also performs a home automation feature by interlocking with the other systems such as parking control, the remote meter reading system, delivery arrival notification and a digital door lock. -Another advantage of the Wall Pad (SHT-7171) is that a user can easily operate the product with a new type of button design even if he/ she is not familiar with the home network devices.